Buffalo bicycles are strong, durable bicycles that are designed to help people in rural Africa carry heavy loads long distances. During the assembly process, the Africa-based product management team oversees a fleet of riders who test current and potential components under punishing field conditions. Buffalo bicycles are compatible with locally available spare parts, ensuring that with proper maintenance they will last for years. Buffalo bicycle components are sourced from manufacturers in Asia who produce each part to the World Bicycle Relief's specifications. Each Buffalo bike comes with a small toolkit and a pump for basic maintenance; to ensure that bicycle owners have access to local, qualified repair service, World Bicycle Relief has developed a Field Mechanics Training Program to accompany distribution. 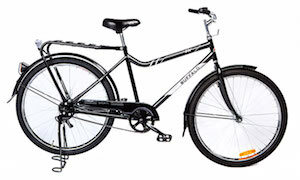 Buffalo Bicycles are designed, tested and assembled in Africa, providing jobs in the local economy. There are facilities in Angola, Kenya, Malawi, South Africa, Zambia and Zimbabwe. Buffalo Bicycles is a wholly-owned, for-profit subsidiary of World Bicycle Relief--a non-profit organization transforming lives through the power of bicycles. Profits from the sale of Buffalo Bicycles help fund World Bicycle Relief's philanthropic programs while building sustainable bicycle infrastructure in Africa.